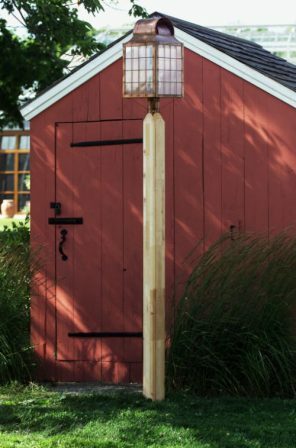 Hammerworks is proud to offer these Colonial Style Light Poles to pair with our handcrafted post lights. We offer a selection of both solid cedar wooden light posts and cast black aluminum poles for you to choose from. First of all we carry a pair of Wooden Lantern Poles for you to choose from. The solid cedar 5x5 Wooden Cedar Lamp Post is a simpler design featuring chamfered edges. Also available is the “Fancy Turned Pole”. This Wooden Light Post features a 5x5 square bottom, and then has some carved detail before transitioning to a round upper section. Either of these wooden cedar poles makes an ideal complement to any of our handcrafted Colonial Post Lanterns. Especially relevant each driveway wooden lantern post is made of unfinished white cedar. Therefore you can leave it in it’s natural state. Of course if you prefer, we offer the option of White Stain for an additional charge. More importantly each lantern post has a center bored wire way which exits out the side of the pole. Also, the 3″ post fitter at the top is compatible with any post light in today’s industry. Furthermore the pole measures 8′ 10″. As a result you can bury it about 2-3 feet underground. Consequently this leaves plenty of height above ground to display your lantern. If you prefer, we can cut the pole down to 8′, still allowing plenty of above ground height to display your handcrafted post lantern. Above all just as with all Hammerworks Lighting Products we endeavor to offer only the highest quality wood lantern poles available. Most importantly each outdoor wooden lantern pole is manufactured from northern white cedar. Secondly it is a laminated product. This ensures a solid split free pole. In addition these poles will not warp or twist. Furthermore cedar by nature produces a stable & long lasting pole resistant to rot, decay and insects. Thus they provide strength and beauty, ready to grace the entrance to your home or business for years to come. 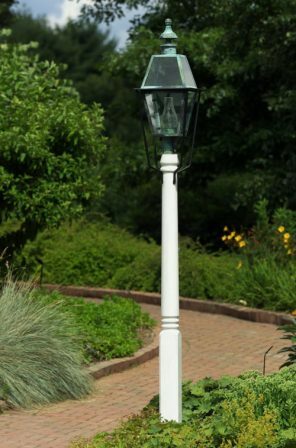 In addition to lantern posts made of wood we offer a selection of classic Aluminum Lantern Poles. 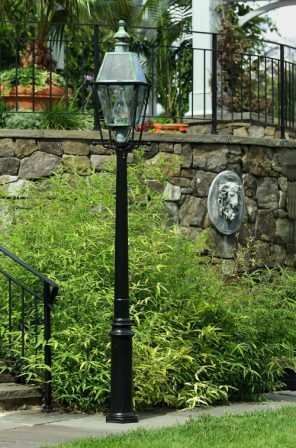 These attractive black cast aluminum poles are a practical choice for displaying any 18th or 19th century post light. Of course a combination of our classic handcrafted post lights and a traditional Aluminum Light Post produces a unified result. Thus it blends to complement any lighting project. 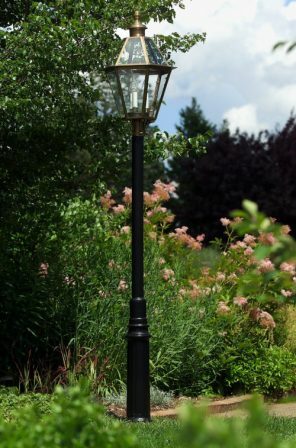 From a single driveway lamp to a complete urban street lighting project, our Colonial Style Cast Aluminum Lantern Poles are chosen by architects, designers and homeowners alike. Since they vary in size and style, there is sure to be one to meet your needs. Of course all Aluminum Colonial Style Light Poles have a standard 3″ post fitter to match any post light made today. Also most are equipped with an “Access Door” at the bottom. In addition some are available with an optional Ladder Rest. Therefore you can add style and charm to your overall presentation. In conclusion our affordable yet ruggedly constructed black cast aluminum light poles enhance any landscape project. Whether you prefer Wooden or Aluminum Lantern Poles you’ll find the perfect one to add the finishing touch to your landscape design scheme. 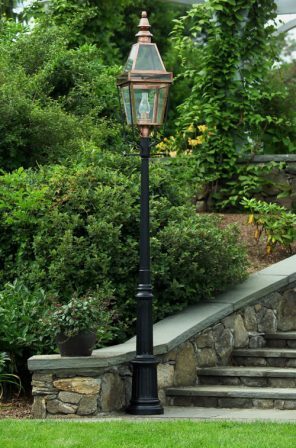 While we gladly offer a selection of Colonial Style Light Poles, our primary focus is actually handcrafted Colonial Lighting. 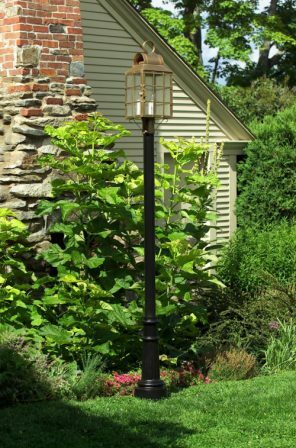 Therefore no matter which style lantern pole you choose, we have the perfect Handcrafted Colonial Post Lanterns to top it off with. Of course all of our Post Tops are completely handmade in the USA. In addition we use only the highest quality solid copper or brass to construct each Period Style Post Light. Furthermore you can choose from a variety of finish options. These include the standard Antique Copper & Antique Brass, as well as Verdigris (Green) and Painted Black on a custom basis. Most noteworthy, we offer several sizes and styles of Period Reproduction Post Lanterns. Our designs include Traditional or Primitive Style Colonial Lanterns ranging in size from the small post P112 to the large Colonial Boston Post Lantern P103. In addition we handcraft an impressive collection of Olde English Tudor Lighting featuring exceptional quality. Furthermore our offerings extend into the realm of Arts & Crafts Style Post Light Fixtures as well. Therefore no matter the size, style, or design collection you seek, you will find it at Hammerworks! Most noteworthy, in addition to Colonial Post Lanterns we create a comprehensive selection of Colonial Lighting. In addition to many types of outdoor lighting we make several styles of interior light fixtures. From Colonial Ceiling Lights for the back hallway room to large Colonial Tin Chandeliers in an ample great room you have countless options. Due to their size and versatility Colonial Wall Sconces remain a popular favorite. No matter what since we handcraft each fixture, custom options are always available. Of course all of our designs are available in a variety of sizes, styles and finish selections. Therefore whether it is one room or an entire home Lighting by Hammerworks meets your expectations.